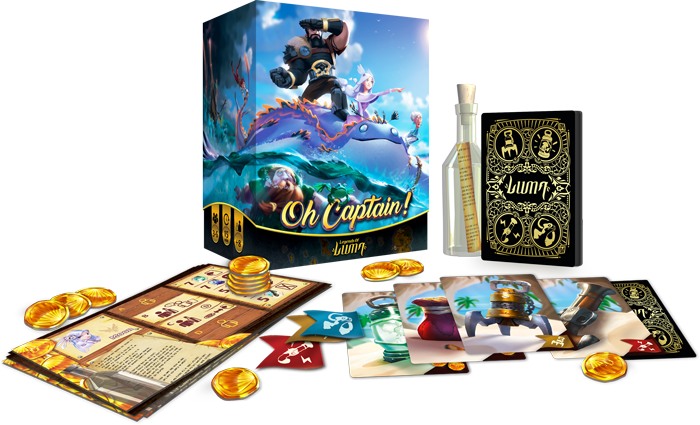 Asmodee just announced their newest game Oh Captain! by Ludonaute. In Oh Captain! players take on the roles of a shipwrecked crew. You were saved by a mysterious creature called the Nukha. The captain orders their men to steal the best treasure from the Nukha’s den. But the crew decides that they want to try to keep the best treasure for themselves. The goal is to gather treasure and sell it to a group of nomads who inhabit the island that you’re shipwrecked on. The player with the most gold at the end of the game wins. At the start of the game, one of you will be designated as the captain, and the rest will be crew.Players will each have their own unique adventurer with their own abilities and amount of gold coins. Players will then take turns diving into the Nukha’s lair by drawing a card from the cave deck. You’ll find cool treasure like a secret pistol or an illuminating lamp. Once you’ve gotten your treasure, you will need to offer to sell it to the captain. But the captain doesn’t get to look at the card. Instead you tell the captain what you found, or you can tell the captain what you’d like them to think you found. There will be some treasure cards that are actually bad for you to have and will lower your standing with the nomads. Some of those cards you will actually have to lie about. If the captain chooses to buy your treasure, you then reveal the card. If you were telling the truth, then the captain gets to use the special ability of the item. But if the captain decides to not buy the item, the player gets to use the special ability. These special powers always hurt another player. If the captain passes on buying the item and the player is using the special ability, then the targeted player has to make a decision. The targeted player can attempt to call the person’s bluff. The player must reveal the card, and if they lied, the attack is negated and the target gets to steal a coin from the attacker. But if the attacker was telling the truth, the attack goes off and the targeted player has to pay the attacker a coin. Then the play passes to the next player. If that player has more gold than the captain, they can either pledge their support to the captain (aka give them a coin), or call for a mutiny (aka become the captain). 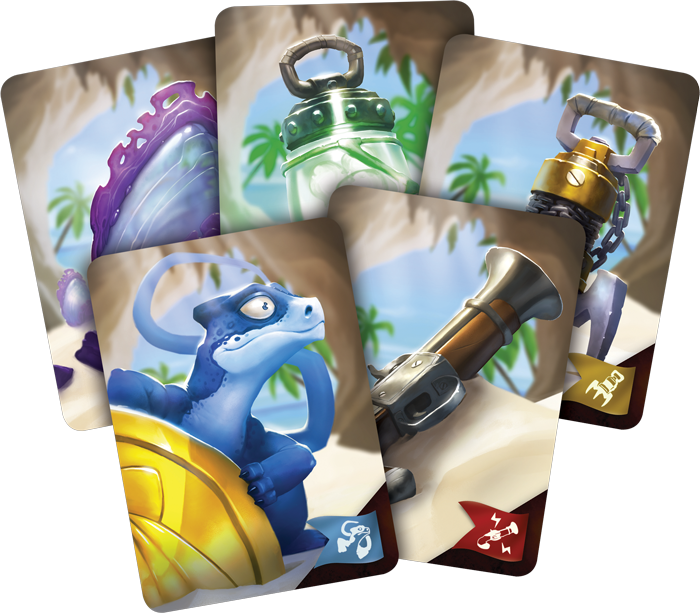 The game ends when the nomad’s arrival card is drawn from the Cave Deck. The player with the largest total of wealth, gold and loot wins. Oh Captain! definitely seems like a fun, light bluffing game. I think this could be a fun game to start a night, before diving into another, heavier game. The rules seem simple and easy to explain, which is why I think this would be a great game to play with friends or family who don’t play a lot of games. Oh Captain! will be released in the second quarter of 2017. It is for 3-6 players, takes about 20 minutes, and will cost $29.99.